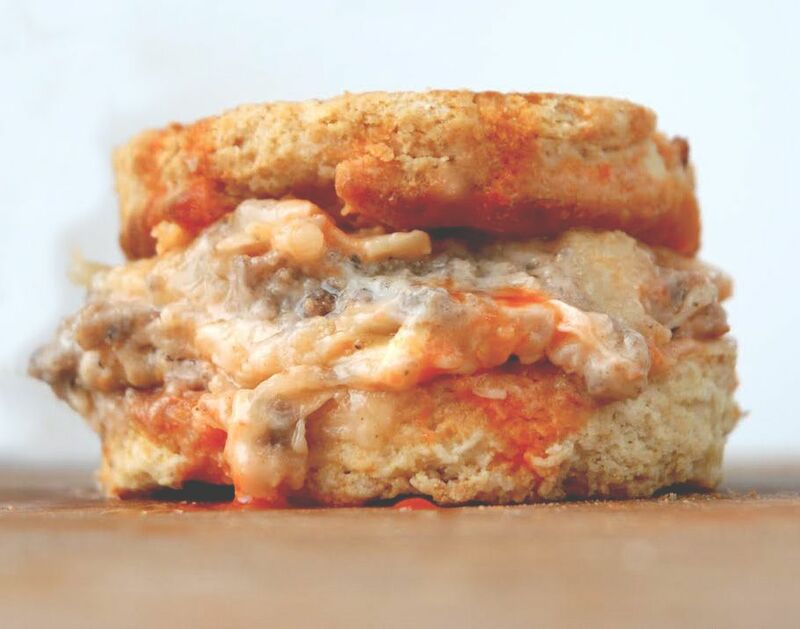 Did you ever think that a handheld sausage gravy and biscuit sandwich existed? Neither did we until we realized that we had 10 pounds of venison sausage in our freezer and desperately needed to get rid of it. And voila! That's how this breakfast sandwich was born. Begin by making the sausage gravy. In a cast iron skillet, brown the sausage and continue cooking until it is cooked through, then add 3 tablespoons of flour and cook for a few minutes – basically binding the remaining fat with the flour to create a roux. After about 2 minutes of cooking the flour-fat mixture down over medium-high heat, you’ll want to add in milk – More or less depending on what you want your sausage to gravy ratio to look like. Then over medium heat, continue stirring until the milk thickens up and you have a beautiful gravy. Salt and pepper to taste and set aside. Now assemble the sandwich. Gently break your biscuit into two halves and flip them inside out. Add half the cheese to one side and then the sausage gravy. Next, add however much hot sauce you'd like and the rest of the cheese. Add the other half of biscuit so that the original exterior is now the interior and set aside. In another cast iron skillet, melt 1 pat of butter and gently place the sandwich in. Cook over medium heat for a few minutes until the biscuit becomes crispy and golden brown. Flip and repeat. Serve immediately.